An Industrial Metal duo from New England, America who are about to self-release this their second album. Invertia are: Dave Coppola (vocals, guitars, bass, FX, samples) and Tim Winson (drum programming, synth, mixing/mastering). Initially, it sounds from the very start as if this is more Electronic than Metal. Another Big Brother doesn’t mess around and encapsulates what follows with the next nine tunes, to a point. When the duo get into the meat and grind of this first song it’s like being continually run over by a ten ton truck with shards of glass and metal spikes for tyres. You are meet with a frantic energy which doesn’t stop, but it is controlled – it has to be: the guitars and programmed drums work together almost as if they are one instrument and the other instrumentation revolves and works around this. This lead track is a concoction of chaos and unrestrained momentum, guitars, drums and vocals ploughing ahead in a furious Black Metal style – this is what takes precedence over just about everything. At the end of the turmoil there are the samples which pinpoint what this song is about but more on that later in the second part. Dystopiate follows in a similar vein: electronic pulsing and bleeps before the tangle of guitars, drums and vocals take over. This tune has a breakdown which adds a short breathing space for the duo and the listener before smashing its way through another course of pulverising and unrelenting battery at ‘stupidly fast’ bpm. So far the silence between each tune is more like a wasted opportunity that should have been filled with something, anything. A slow down in the pace now as Non-Sunni takes centre-stage. It seems to be more of a conventional song with a clearer distinction within the flow and progression. What you hear is the vocals delivered always in the harshest tone, guitars (and bass) thundering along in an almost relentless sonic flow, the programmed drums power away like a maniacal self-possessed machine. The sonic dissonance and details heard on songs such as Scatter and Existence Exit is an essential part defining even more the intertwining influences taken from Tech Death Metal and other Industrial Metal groups combined within the approach the duo take on this album. The release contains its singular character and within the 33 minutes there is little variation in the production but the individualism of each song shines out. I can’t even isolate my favourite songs on this album – listening out for the defining riff(s) in each and how the song flows and progresses is the important factor. Everything has been worked out to a specific plan with a definite conclusion which sets it above even some of the established names of Industrial Metal and sees Invertia building on what they previously created. Also surprisingly there are two guests for the album: Aaron Rossi (Ministry, Prong) and Kevin Talley (Suffocation, Dying Fetus, Six Feet Under) who appear on Distopiate and Non-Sunni, and The Forever Incision, Scatter and Not For Taste. Apologies but I’m not sure whether I can identify the tunes the two guests feature on as being different from the other five but that’s because I want to listen to Invertia. I wouldn’t call this Industrial were it not for the fact that the lyrics (and samples) are about how the technology and modern philosophies around us, that we use or are subjected to in our lives, have made slaves of us. This machine which we feed is mostly invisible and untouchable which then in turn makes it the subject of true Sci-Fi Horror where we are the oil that greases the wheels of the digital machinery. It is still raw and yet has pinpoint accuracy in its execution – yes, it is programmed drums but the quality of musicianship that Dave Coppola displays makes you wonder if he isn’t part of the machinery of Invertia as well. The variation of what the duo achieve is limited (and not simply fast or slow-ish) but all through the ten track album you are provided with music which pulls you in by the way in which rhythms clash and collide and unify. The general style does go towards Black / Extreme Metal with the digital side being set to a minimum, considering how the balance could have been toward an Electronic bias. This is an album made with love or hate depending on how it is viewed: love in the way the Dave Coppola and Tim Winson have created a singular vision to the album, the way it is produced, etc; hate in that what the duo are focusing on is something they feel so strongly about which is the freedom within our lives to choose rather than be told what to think as if the human race is a brainless flock of sheep that must always be guided. 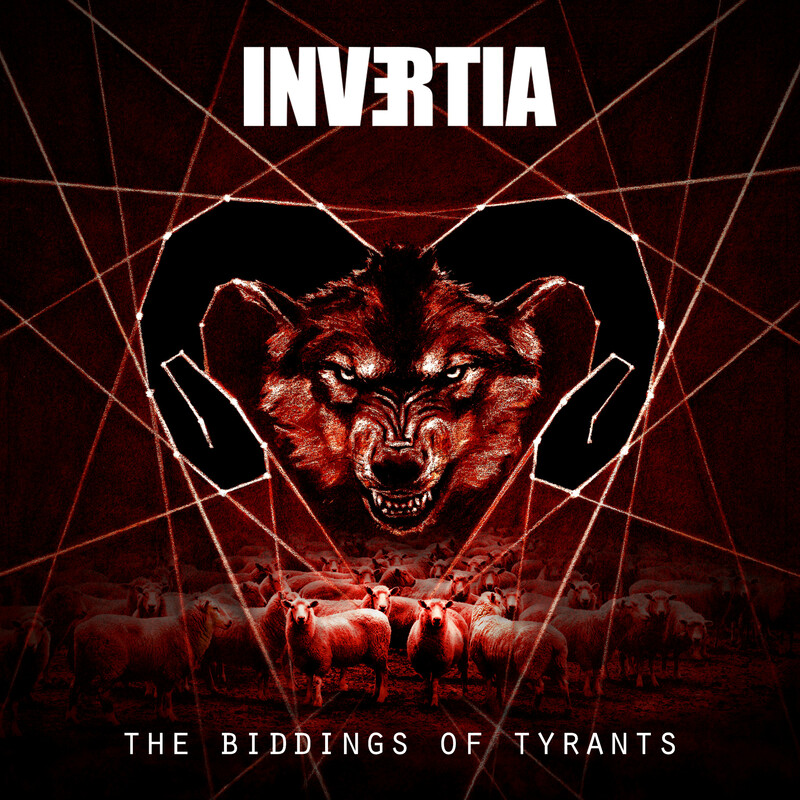 An album which redefines Invertia from their début album and marks a level of achievement that the duo needed to attain.